Last night, in the last three minutes of an episode of “Caprica,” where Dad is trying to get robot Zoe to shoot the dog in order to prove she’s not Zoe, Dave shut it off. “I’m done,” he said. He stood up. Then he sat down and set the Roku controller on the coffee table. Then he stood up again. I stared at the suddenly-black screen. A second ago I’d been watching a border collie cocking his head, all confused, looking from the robot to Dad. Clearly he knew Zoe was inside the robot. He really wanted her to throw the ball so he could fetch it, but instead Dad had given the robot a gun and made her aim it at the border collie. “Of course,” I said, “It’s no big deal.” And we spent the rest of evening reading or talking or something. I still want to see the last three minutes. I bet the robot misses. If the robot doesn’t miss, I too am done with the show. Why am I done? I don’t know. Because the fake killing of a dog doesn’t seem fair. Why doesn’t it seem fair? Human characters have been killed right and left – the two Tauron guards, everyone on the commuter train. But when you bring a cute, wriggling border collie onto the set and ask us to pretend for him that he is the dog in the story, it’s different than when you bring humans on to the set and they pretend they are Tauron guards or commuters on a train, and all we have to do is decide whether they pretend well enough. But a border collie is unsurpassed in being a border collie. When it delivers a red ball to the feet of a hunk of metal, I have to do the translation. And when Dad then forces robot Zoe to shoot the dog instead of throwing the ball, and I have to then untranslate that in my head to make it okay, because of course no one’s actually getting shot, I feel foolish. I feel like they misused my good will, my willingness to pretend. I feel silly. The vibe last night was that we wouldn’t be watching “Caprica” ever again. It’s too bad, because despite lukewarm reviews from “Battlestar” friends I’d been loving the ways it explored how the Cylons came into being and why they were so gosh-darned upset at humans. 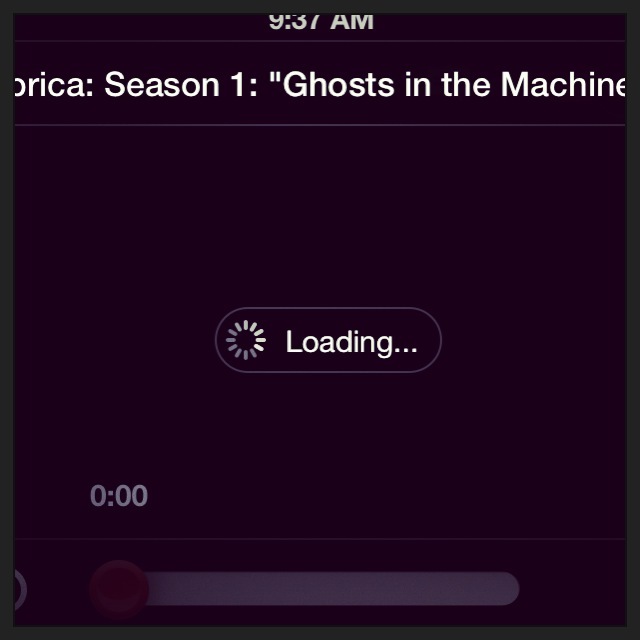 In fact, this morning, when Dave was downstairs, I opened Netflix on my phone to secretly watch the last three minutes. I figured, if the robot missed, I could subtly work in an argument to keep the show in the queue. The episode was still in the Continue Watching row, with three minutes left. I hit Play and kept my finger over the Pause icon, in case I heard Dave coming up. I turned the volume way down. The little circle spun, the screen looked ready to display, but it stayed black. It was like there was a ghost in the machine, keeping me away. I hit Play a few more times, like that would help. I waited, looking from the door to the screen and back again. Dave stayed downstairs. The circle kept spinning and the screen stayed black. Eventually I gave up and got on with my day.